CSK is one of the closest units in IPL who gel together very well. We have heard players say that once they join CSK, it is very difficult for them to leave to other franchises. Apart from cricket, the CSK players also do a number of fun activities. Now we have seen that a few of the CSK players have written their names in Tamil. Some of the players also have some tag lines like 'Chinna Thala' for Raina and some have funny nicknames, like Odinen( Run) for Tahir. It appears that someone has written in Tamil first and they have repeated after it and have done a really good job. Which out of these players do you think has done the best? This page contains news relating to various facts and events. The views are generally about current affiars and general topics in diversified areas such as political, international, national, and regional issues, sports, health, travel, lifestyle, technology and business. People having similar interets on the above topics will find this page useful. 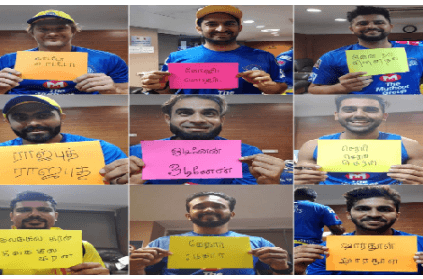 CSK players write their names in Tamil | Sports News.